This morning it emerged that four out of five English hospitals inspected by the Care Quality Commission had been given an 'inadequate' or 'requires improvement' judgement on their safety levels since the introduction of so-called "Ofsted-style ratings". Safety issues identified by the regulator included patients waiting longer for appointments, call bells not being answered promptly (presenting a safety issue as staff do not know the reason for the call until they respond), and staff shortages at night. 82 hospitals had been inspected, of which 8 were rated inadequate, 57 were requiring improvement and 17 were rated good on 'safety'. None were rated outstanding. "This picture is not representative of acute hospitals across England". That's because inspections under the new approach have focused on those mostly "deemed higher risk", alongside some the regulator felt were likely to score well. So it's not possible to extrapolate the figures to find the proportion that are 'unsafe' nationwide. 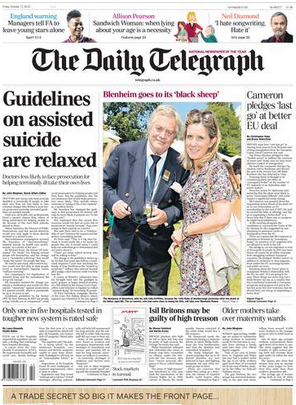 The Telegraph's front page correctly referred to one in five "tested in tougher new system" as safe, but the headline of its online edition refers to "four in five NHS hospitals not safe". The Mail front page reported from the findings that four out of ten of all hospitals are 'unsafe' - on the basis that the 65 hospitals rated poorly represented 40% of the total of 162 NHS hospital trusts. This might be interpreted as meaning the remaining 60% are 'safe' - but that would be wrong since most of these haven't been inspected yet. It makes this clear in the body of the article. So while it's expected that the remaining hospitals may mostly perform better on safety judgements, all we can say at the moment is that a minimum of four out of ten hospitals had unsatisfactory safety levels. 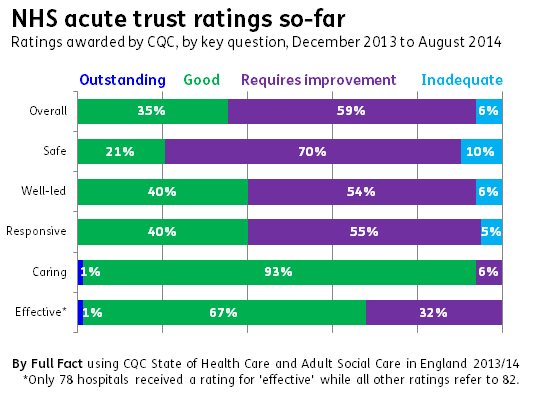 Safety is one of five areas in which trusts were rated, as well as being given an 'overall' rating. The Independent picked up on this overall rating to claim that "More than half of NHS hospitals 'require improvement' and at least five are 'inadequate'". Again, since the hospitals inspected so far are not representative of the state of hospitals nationwide (which it acknowledges in the body of the article), we don't yet know what proportion of all NHS hospitals would be judged in this way. We'll be asking for corrections from the Express, the Independent and the Telegraph.